New technological advancements in dentistry have allowed us to do natural tooth coloured fillings. The filling integrates with the tooth…it doesn’t weaken the tooth as a silver filling does. We now can make a smaller hole, since the white material can flow into small places. Due to the smaller hole, there is more of your own tooth left, leaving it stronger. Secondary decay is easier to spot beneath tooth coloured fillings. If damaged, they can be easily fixed. They are temperature and electrical insulators-resistant to extremes of heat and cold. Environmentally safe-no hazardous metal wastes to dispose of and no risk of mercury allergy. Allowing us to fix smaller cavities. They are a more natural, attractive choice. Composites bond to the tooth to support the remaining tooth to help prevent breakage. Composite insulate the tooth from excessive temperature changes. 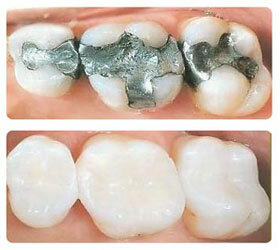 Composites (white fillings) last about 8 years with a range of 7-10 years.